A wonderful book to encourage imaginative play and risk-taking, or to support creative exploration with clay! What can you do with two blobs of clay? Create something amazing! But don't leave them alone for too long. Things might get a little crazy. In this photographic friendship adventure, the claymates squish, smash, and sculpt themselves into the funniest shapes imaginable. But can they fix a giant mess before they're caught in the act? 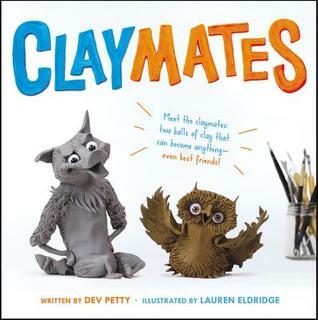 Claymates was written by Dev Petty and illustrated by Lauren Eldridge. It was published in 2017 by Little Brown. The simple beginning question, “So, are you new here?” immediately invites readers to connect with these characters, because all kids have been in a new situation. The illustrations are actual photographs of modeled clay, shown talking to each other. So brilliant, because kids love using kids love using their imaginations to make toys and their creations talk. We also get a sense of their characters right away – the gray blob has a positive, adventurous outlook, while the brown blog is more cautious. The entire text is structured as a conversation between the two main characters (balls of clay!) so it’s a great example to study to learn about telling a story through dialogue. I especially love how the “speech bubbles” are small, torn scraps of paper! Another nice feature is how the ending circles back to the beginning with the “What happens now?” question. As an educator who guides learning through inquiry, I love the way this story starts with the question: “What do you think is going to happen?” While reading this book aloud, there are opportunities to talk about taking risks and being creative, as well as persistence and problem-solving. Or you could discuss friendship and how friends help each other. Although the publisher lists the recommended ages for this book as as 4-8, it could easily support the art process in older elementary grades too.The photographs show us how to create form and texture using clay, and there is so much in them that I can imagine students returning to this book to look at it again and again. I want this one for my personal classroom collection! Do a creative modeling clay challenge: Can you create ten different characters from the same ball of clay, using different textures? Create a stop motion video of two clay characters interacting, using paper notes to show dialogue. Play “hide and create” with a partner. Hide your eyes while your partner creates a cool creature using your blob of clay. Keep track of what creatures you made for each other. How does your partner’s idea influence yours? Mr. Schu Reads showcases the book trailer along with his review. Little Brown provides a book chat with the author and illustrator. I thought asking the question What do you think is going to happen? was good too. Sounds like a fun book for little kids. What a great way to get kids involved and thinking. Added to my library list.